Eggs are an excellent source of protein, vitamins and minerals, but one large egg also contains as much as 5 grams of fat and 2 grams of saturated fatty acids. One whole large egg also contains 213 milligrams of cholesterol, all of which is in the egg yolk. To avoid consuming egg cholesterol, the United States Department of Agriculture recommends using only the white part of the egg in cake and cookie recipes. You also can use egg whites to make a healthy omelet. The egg white from one large egg contains 4 grams of protein. U.S. Grade A eggs and Grade AA eggs are best for making omelets, since the egg white in U.S. Grade B eggs is not as thick. The egg white in one large egg has between 15 and 17 calories. 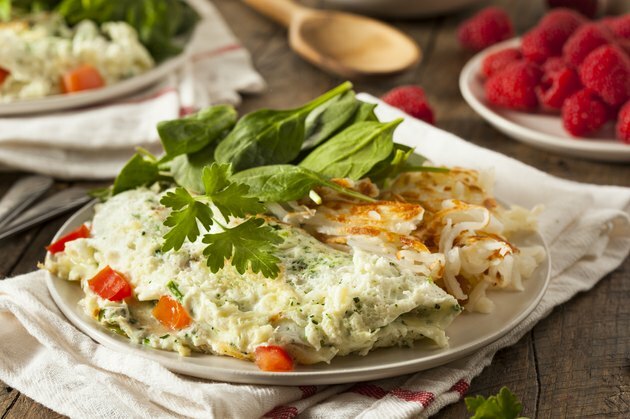 An egg white omelet contains no carbohydrates or fiber. The egg white from one large egg provides with 0.145 milligrams of riboflavin, or vitamin B-2. According to Linda Page, author of "Linda Page's Healthy Healing, All New Eleventh Edition," riboflavin is required to create energy and to help you utilize fat and carbohydrates in your body. Riboflavin also is beneficial to eyesight and skin. An egg white omelet supplies you with potassium, which is responsible for sending messages between cells and nerves, and also improves the way your muscles work. In addition, potassium helps protect you from high blood pressure that can result in a stroke, and assists in supplying oxygen to the brain to maintain mental clarity. The white portion of one large egg contains 54 milligrams of this mineral. The egg white from a large egg contains 55 milligrams of sodium. Adults should consume more than 2,300 milligrams of sodium a day. The amount of sodium in the egg white allows you to stay within the suggested guidelines for keeping your body hydrated without increasing blood pressure. The white part of one large egg contains 6.6 micrograms of selenium, a potent antioxidant that not only offers protection from free radical damage, but also protects the body against poisoning from heavy metals. The body's ability to fight illness also is boosted with the help of selenium. Along with vitamin E, selenium helps stop the buildup of cholesterol in the arteries. An egg white omelet made with 1 tablespoon of olive oil supplies you with 1.864 milligrams of saturated fat, but it also supplies you with 9.85 milligrams of monounsaturated fat and 1.421 milligrams of polyunsaturated fat. Saturated fat is solid fat that causes health problems that often lead to heart disease. Monounsaturated and polyunsaturated fats are liquid fats that do not solidify and aid in lowering cholesterol with the help of fiber.